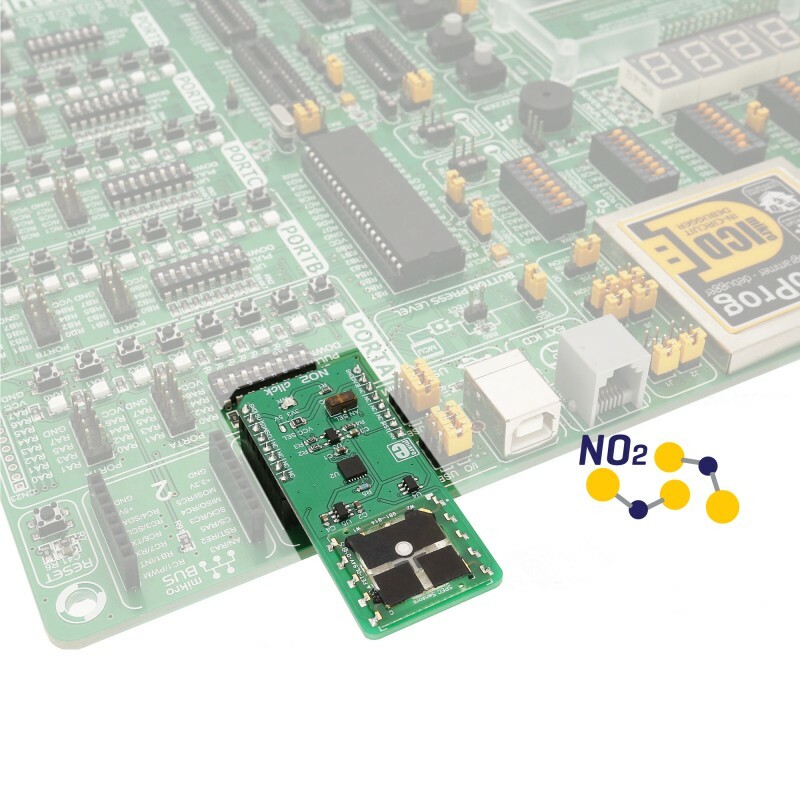 NO2 click is a very accurate nitrogen-dioxide gas sensor Click board™, equipped with the SPEC amperometric gas sensor which electrochemically reacts with the nitrogen-dioxide (NO2). It is supported by the LMP91000, a high-precision integrated analog front-end IC (AFE), perfectly suited for use in electrochemical sensing applications. 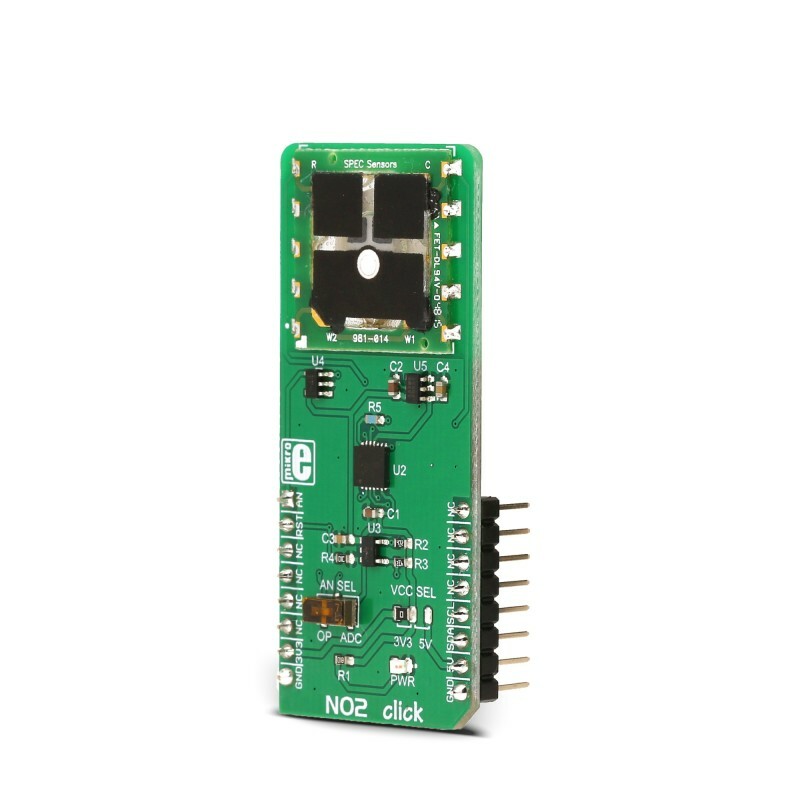 The Click board™ also provides the reference voltage required by the sensor and offers a choice between the analog output from the AFE IC buffered with the low noise op-amp, and digital output from the 12-bit SAR A/D converter. The AFE IC provides a unified platform for many types of electrochemical sensors and as such, it packs a range of different features which simplify the use of various electrochemical sensors. The AFE IC supports gas sensitivity in a range from 0.5 nA/ppm to 9500 nA/ppm. 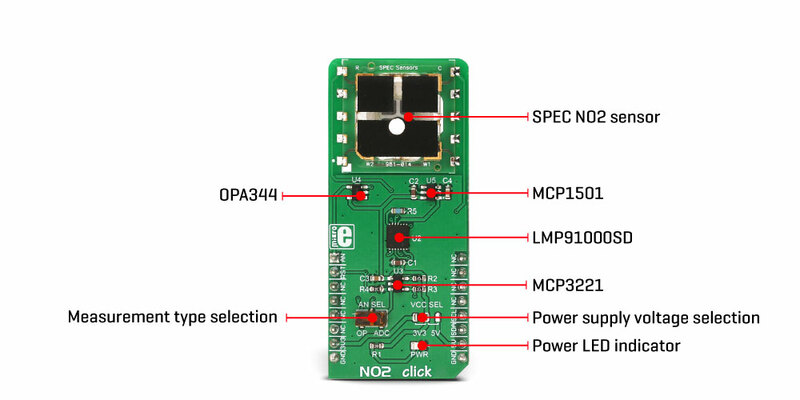 Equipped with the SPEC NO2 sensor with the resolution of 20ppb, the Click board™ can be used for various air quality applications, air purification control, atmospheric NO2 presence detection applications, and similar. SPEC Sensors are amperometric gas sensors, electrochemical sensors which generate a current proportional to the volumetric fraction of the gas. This current is converted and transformed into the voltage by the analog front-end IC (AFE), so it can be sampled by the MCU, or converted with the external A/D converting circuits. The sensor used on this board is the 3SP-NO2-20 gas sensor from SPEC Sensors, which can sense NO2 concentration up to 20ppm. The sensor has a very short response time, however the longer it is exposed to a particular gas, the more accurate data it can provide. This is especially true when calibration is performed. It should be noted that the sensor has a very high sensitivity to small particles of dust, condensed water, and other impurities, which might prevent gas to reach the sensor. It is advised to protect the sensor when used in critical applications. In ideal conditions, the lifetime of this sensor is indefinite, but in the real-life applications, the expected operating life is more than 5 years (10 years at 23 ± 3 ˚C; 40 ± 10 %RH). Although very reliable and accurate, this sensor is great for building relative gas sensing applications. For example, it can detect an increased level of NO2 gas. However, when developing applications for the absolute gas concentration, the sensor needs to be calibrated and the measurement data needs to be compensated. Factors such as the humidity and temperature can affect measurements, sensor reaction curve to a specific measured gas (nitrogen-dioxide in this case) is not completely linear, and other gases might affect the measurement (cross-sensitivity to other gases). For this reason, a range of calibration routines has to be done in the working environment conditions, in order to calculate the absolute gas concentration. 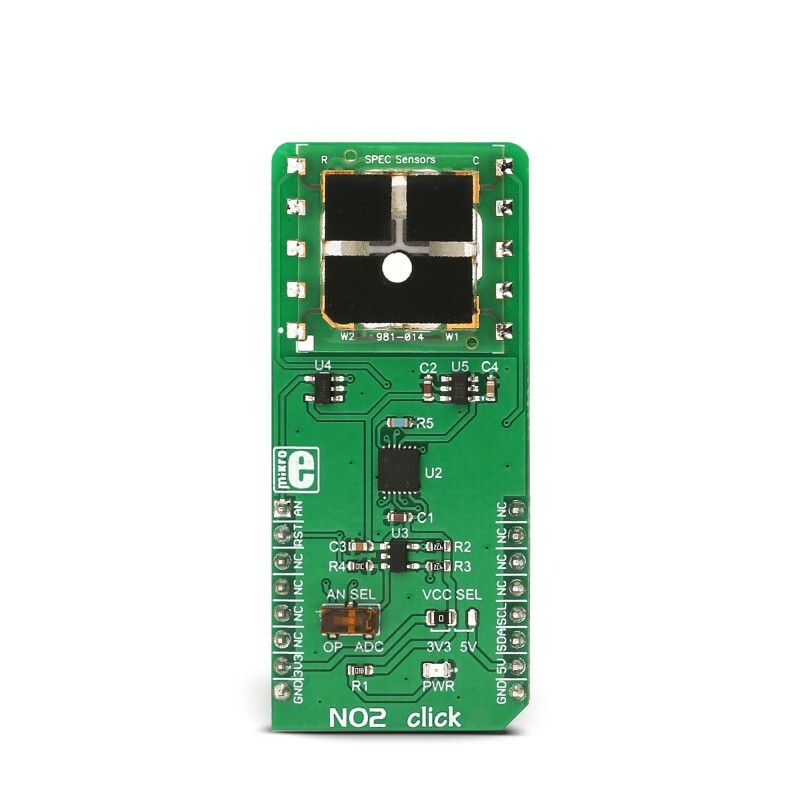 NO2 click uses the LMP91000, a configurable AFE potentiostat IC for low-power chemical sensing applications, from Texas Instruments. It provides the complete sensor solution, generating the output voltage which is proportional to the sensor current. A transimpedance amplifier (TIA) with the programmable gain is used to convert the current through the sensor, covering the range from 5μA to 750 μA, depending on the used sensor. The voltage between the referent electrode (RE) and the working electrode (WE) is held constant, with the bias set by the variable bias circuitry. This type of sensors performs best when a fixed bias voltage is applied. The sensor manufacturer recommends -200mV fixed bias for the sensor used on this Click board™. The bias voltage and the TIA gain can be set via the I2C registers. In addition, there is an embedded thermal sensor in the AFE IC, which can be used for the result compensation, if needed. It is available via the VOUT pin, as the analog voltage value in respect to GND. The Click board™ has two additional ICs onboard. The first one is the MCP3221, a 12-bit successive approximation register A/D converter, from Microchip. The second IC is the OPA344, a single supply, rail to rail operational amplifier, from Texas Instruments. It is possible to use the onboard switch, labeled as AN SEL, to select the IC to which the VOUT pin from the LMP91000 AFE is routed. If the switch is in the ADC position, the VOUT pin will be routed to the input of the MCP3221 ADC. This allows the value of the voltage at the VOUT pin to be read via the I2C interface, as a digital information. When the switch is in the AN position, it will route the VOUT pin of the LMP91000 AFE IC to the input of the OPA344. The output of the OPA344 op-amp has a stable unity gain, acting as a buffer so that the voltage at the VOUT pin of the AFE can be sampled by the host MCU, via the AN pin of the mikroBUS™. 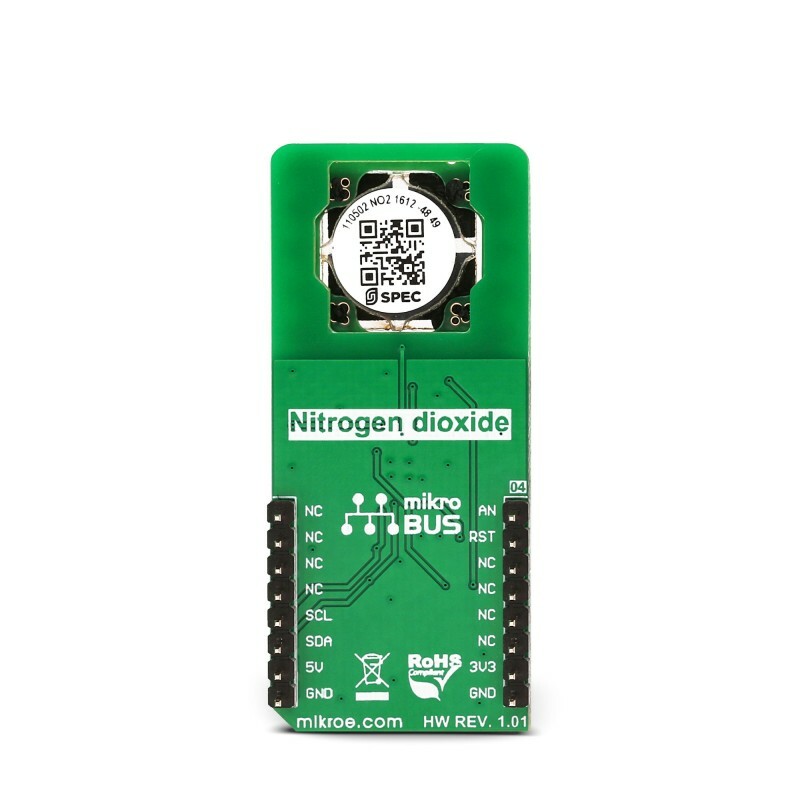 The RST pin on the mikroBUS™ is routed to the MEMB pin of the LMP91000 and it is used to enable the I2C interface section, thus making it possible to use more than one chip on the same I2C bus. When it is driven to a LOW logic level, the I2C communication is enabled and the master device (host MCU) can issue a START condition. The RST pin should stay at LOW during the communication. 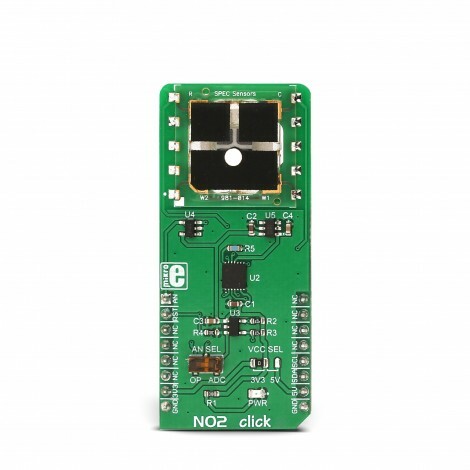 This Click board™ can work with both 3.3V and 5V. An SMD jumper labeled as VCC SEL can be moved to the desired position, allowing both 3.3V and 5V MCUs to be used with this Click board™. This table shows how the pinout on NO2 click corresponds to the pinout on the mikroBUS™ socket (the latter shown in the two middle columns). We provide a demo application for Alcohol 2 click on our Libstock page, as well as a demo application (example), developed using MikroElektronika compilers. The demo can run on all the main MikroElektronika development boards. The library initializes and defines the I2C bus driver and drivers that offer a choice for writing data in the register. The library includes a function for reading NO2 data in ppm and function for reading ADC data. System Initialization - Initializes I2C bus and set AN pin as INPUT and RST pin as OUTPUT. Application Initialization - Initializes I2C driver and device configuration. Application Task - (code snippet) - Gets NO2 (Nitrogen dioxide) data as ppm value and logs to USBUART every 500ms. The full application code and ready to use projects can be found on our LibStock page.